Since 1997, thousands of players, collectors, and enthusiasts from around the country have turned to Dan for their most challenging and difficult repairs. Top crack on your Taylor? Fractured headstock on your vintage Les Paul? A neck reset on your prewar Martin? When Dan’s finished you’ll forget it ever happened as you return to making music with your favorite partner. Dan began learning his craft in 1996 at Red Wing Technical College (Now Minnesota State College – Southeast Technical) in Red Wing, MN. He and his wife live on the north side of Chicago with their dog, CFW greeter Reese. Dan loves taking in live music and rooting for almost all of Chicago’s sports teams. Steve began working on guitars in 2000 at Bryan Galloup’s School of Luthiery. Prior to that, he spent 5 years teaching high school English in Chicago and the southwest suburbs. Over the years, Steve has established a reputation as a knowledgeable, honest, and skilled repairman. He particularly enjoys working on guitar electronic repairs and reviving old guitars that have been in hiding for a while. He lives in the Lincoln Square neighborhood with his family and occasional substitute shop-dog Olivia. Since 2000, Chicago guitarists and bassists have turned to Pat for complete servicing of their amplifiers. He prides himself on helping musicians “find their tone – the sound that you hear in your head – the way your gear ought to sound.” He trained at the Electronic Institutes of Pennsylvania, graduating in 1985, and has spent the years since focusing on how to get great sounds out of guitar and bass amps. Pat has been a professional bass player and a regular in the Chicago Blues scene for some 25 years, performing and touring with Eddie Clearwater, Willie Kent, and Guy King among others. He also hand-builds the beautiful Fender-inspired Sweet Amplifiers. Prior to joining Chicago Fret Works in the summer of 2011, Joe was part of the customer support team at Fender Guitars in Scottsdale, AZ. Before that, He taught guitar building at the Roberto Venn School of Luthiery in Phoenix. 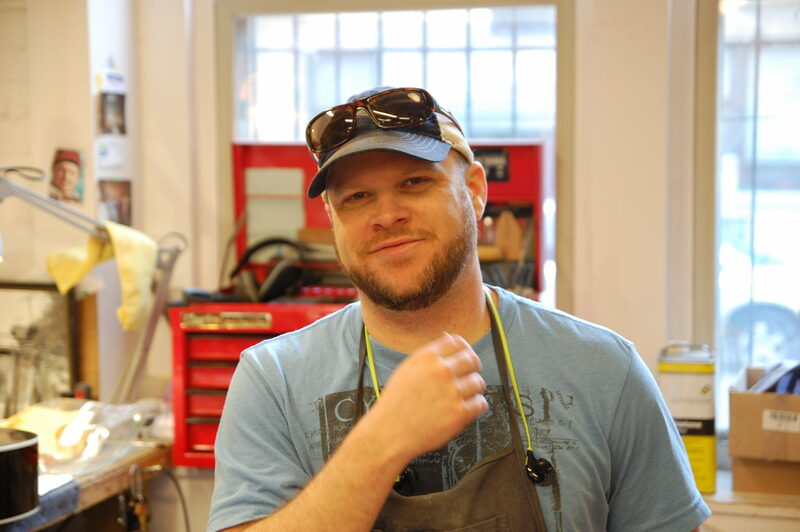 He brings a deep understanding of guitar construction and repair along with a dedication to customer service. Joe now lives in the Wicker Park area of Chicago with his wife and two dogs. When he’s not repairing guitars, he plays Australian Rules Football (an actual sport!) and was a member of the 2012 National Champion Chicago Swans! Greg grew up in the southwest Chicago suburbs before going to Western Illinois University to study music. After a few years of odd jobs, he decided to attend Bryan Galloup’s School of Guitar Building and Repair. Greg joined Chicago Fret Works in the summer of 2017. He currently lives in Chicago with his wife and dog. When he’s not fixing guitars, he enjoys traveling, playing board games, listening to his record collection and taking photos with his vintage Leica. Troy grew up in the south suburbs of Chicago and began tinkering with guitars while he was in high school. Before joining the CFW staff in 2018, Troy Anderson was the lead guitar repair tech at Guitar Center in Country Club Hills, IL. He is a pop & rock singer/songwriter and multi-instrumentalist. You can check out some of his work on Soundcloud. When he isn’t playing or repairing guitars, Troy is usually at a dog park playing catch with his two golden retrievers JJ and Josie. Whether you have a vintage gem or something fresh off the shelf — Troy is your guy to get it setup and playing the best it can. The first employee to join CFW, Reese is always happy to see you. He enjoys greeting customers, especially young ones, with a tail wag and the occasional kiss. When he’s not on duty, he likes playing frisbee on the lakefront, camping, and sitting on sofas. Sometimes Reese needs a day off too. When he does, you’ll often find sweet Livy here to take over tail-wagging duties. She would love it if you’d put down that guitar and throw her ball please.